Rainbow Gardens and Quilt Mascot? Posted on February 21, 2018 by Elizabeth E.
So, a quiet and reserved “YESSSSS!” was my response. I soon will have the poster in my possession, which I plan to tape up on the door to my sewing room studio. While the real life poster should arrive here soon, I was sent this image of the poster by a an observant reader of mine, who saw the poster and sent me a photo of it. If you are up in that area, put it on your calendar — I would love to go to a quilt show that has live music. Since we’ve all just finished watching the Olympics in Korea, I thought I would get you prepped up for the Tokyo 2020 Summer Olympics, by showing you their patchwork-like logos. 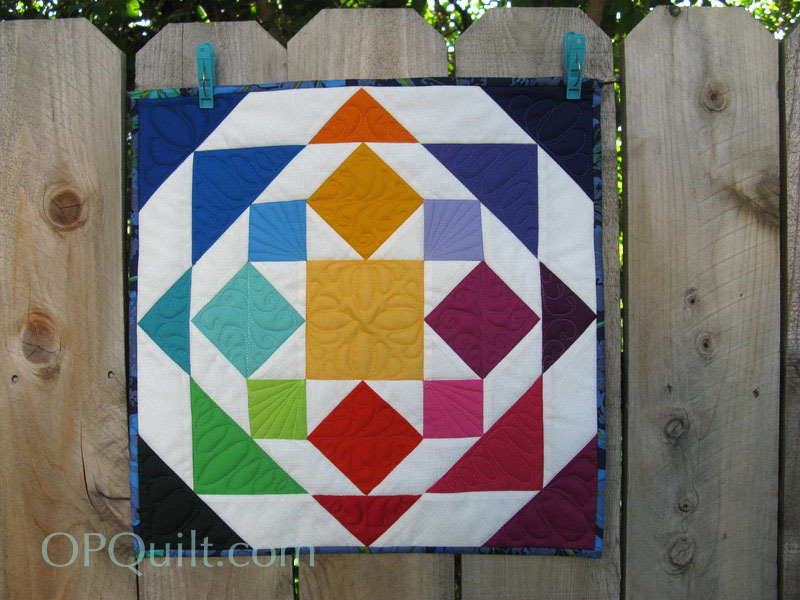 Can we make quilts like this? They are auditioning their mascots now, because no matter where you are in or what you are doing in Japan, there is a mascot for it. I think we need a quilt mascot. I made this image in my very first Digital Art Class; the other students thought I was pretty much a nut-case, but I still like Lady Liberty draped in a quilt. 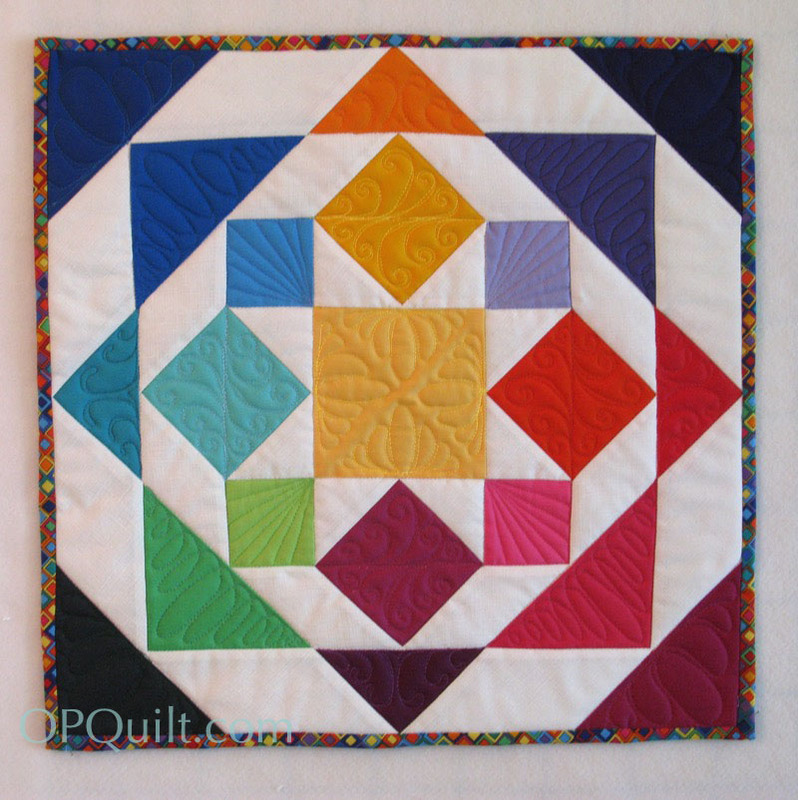 But now as we are more international, we need a cute little quilty creature (I vote patchwork with some appliqué) to carry forward our message. Go to it, you creatives! 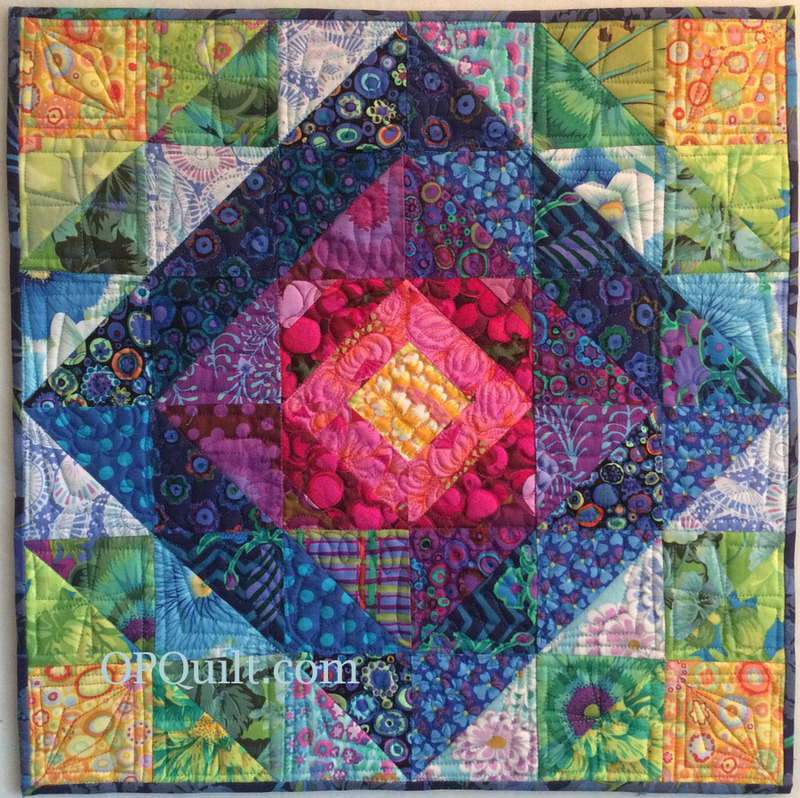 Posted on June 7, 2017 by Elizabeth E.
Rainbow Gardens (the original) was made for a swap back in 2015, and I always wished I’d kept it for myself. So this week I did the next, best thing: I made a new one. 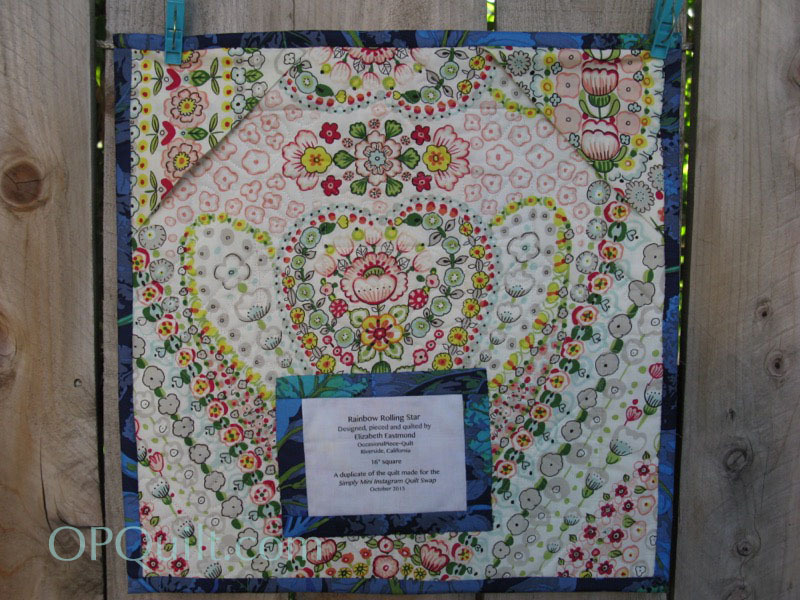 The backing is “pindar paisley” from Alexander Henry, from 2012. The front of the quilt is all Kaffe Fasset fabrics, some new, some older. I also updated the pattern, trimming out this and that, and editing it more tightly, and it is up on Craftsy for sale, if you want to replicate this. And even though it feels strange to say this, I’m going backwards and keeping the number from the original make: this is quilt #148 of mine. I so rarely duplicate my quilts, that this feels a little odd. I have plans to remake one more, but that will come later this summer. 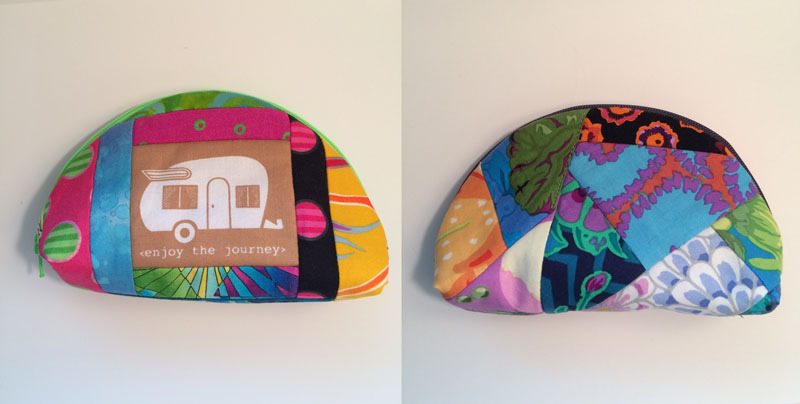 After sending off these two quilts to their owners, I wised up and began duplicating everything I swapped from then on. I rather like my quilts, I guess. 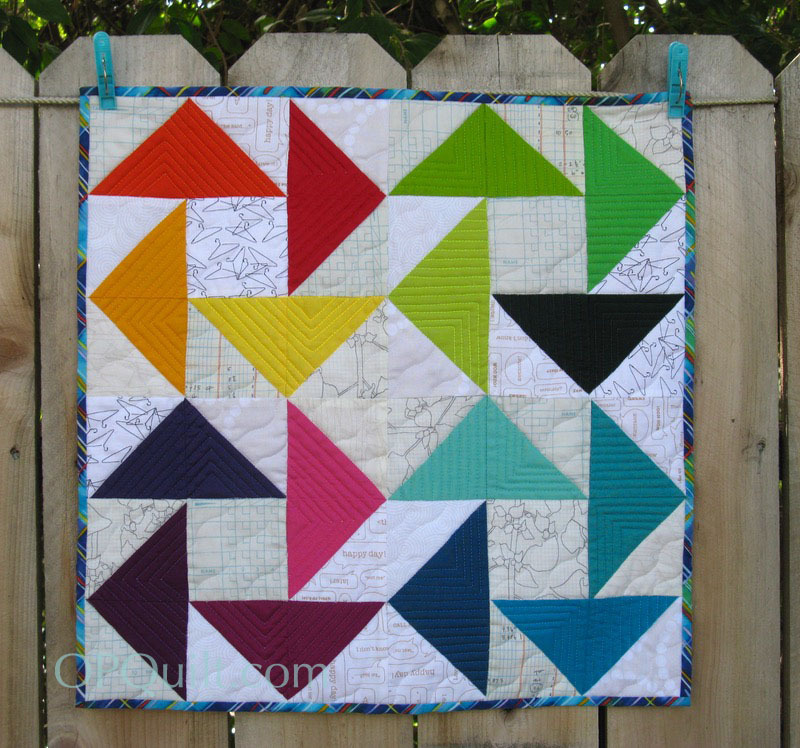 Have you ever swapped a quilt, and then wished you had it back? I also finished another quilt this week. Stay tuned. Posted on October 16, 2015 by Elizabeth E.
This past summer, I joined four swaps, then had my head examined and swore never to do it again. It was sort of a good thing to have some small things to try out my design skills and to keep me quilting, so I guess another title for this post is “How I Spent My Summer Vacation.” I do plan to do individual posts on a couple of them (so you’ll see them again), plus I have one more mini quilt that I made with quite a story (not shown, but soon). But so far, here they are, in the order they rolled out from my house. Although a little bit late (she had fabric and pattern issues), Emily sent me mine and I am so in love with it. I ended up drafting her a pattern on my QuiltPro quilt software, which I’m happy to share with you. It’s in a PDF file: Emily’s House On the first page, the piece for the narrow sashing around the central patchwork square is cut off. I’d recommend using the width of the pattern piece as a guide and cutting a strip to fit your work after you start sewing it together. This post has links to my Craftsy/PayHip store where you can purchase the pattern. 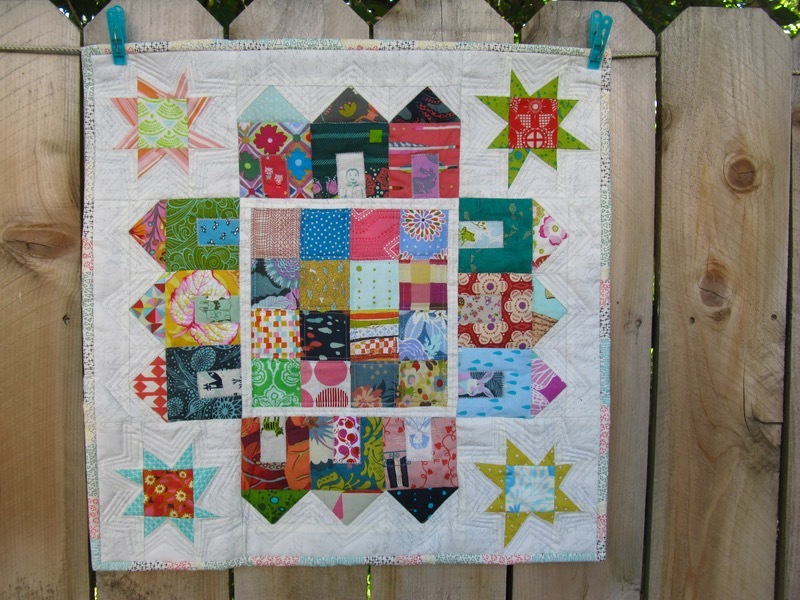 Here is the creative and beautiful quilt I received from that swap–a lovely Dresden-plate type circle of houses. 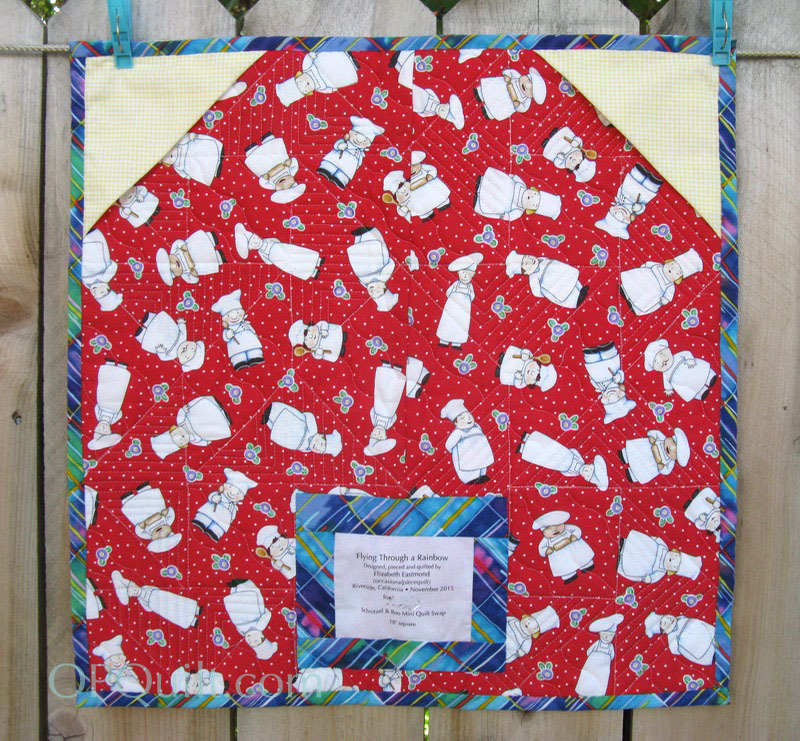 I love them all and love the variety of sewing machine fancy stitches that my partner used. 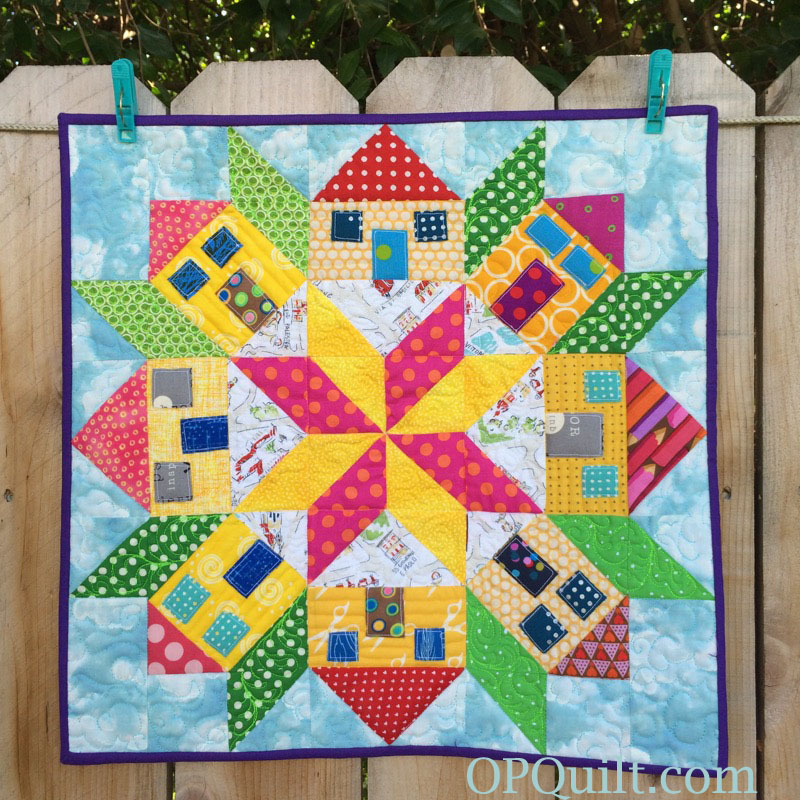 I hear there is a pattern out there for it called Dresden Neighborhood (by Persimmon Dreams) and you can buy it from Craftsy. One hallmark of swaps is the little gifts that you send, although I did join a swap titled “Simply Mini.” (More about that one later.) I made two of my swap partners Dumpling Pouches and filled them with interesting PostIt Notes, some washi tape and quilty trinkets. I’ve seen some swap loot that is over the top; I hope my partners aren’t disappointed (all of them have received their packages). 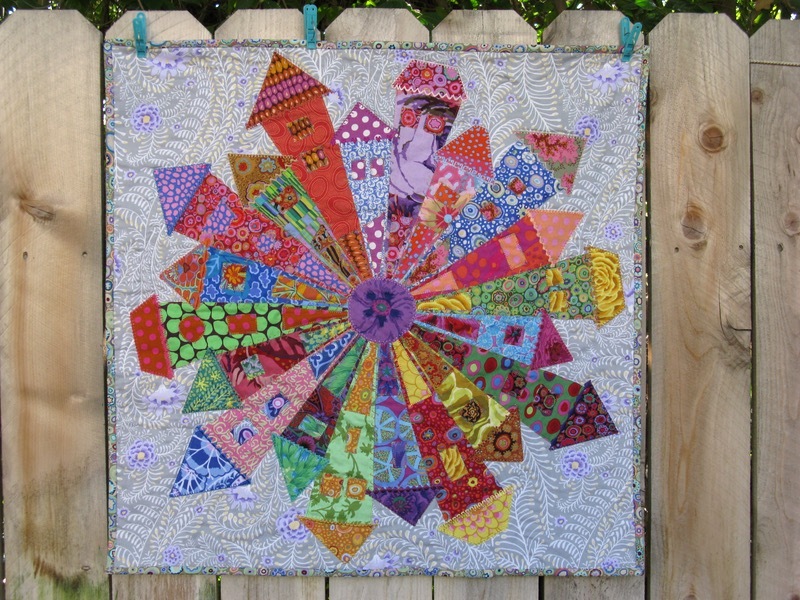 Rolling Rainbow Star–I made one for the Simply Mini Swap and then had to make one for myself. I changed up the binding on it to tell them apart. Flying Rainbow. The last one I made was for the Schnitzel & Boo swap–the grandmama of all swaps on Instagram, now in it’s fourth year. I wanted to say I did that one, and now I can. The quilter I was to send to liked bowling, cooking and classic comic books, so I bought her some bowling score fabric to use the quilt, and backed it with fabric showing wee chefs and bakers.